Winifred Page and her corgi, Watson, move to Estes Park to hit the Reset button on life. Fred is about to open her dream bookshop, and the only challenges she anticipates are adjusting to small-town life, tourists, and living close to her loveable mother, Phyllis, and hippy stepfather, Barry. If you've been reading my blog for even a minute, you are well aware that I love a cozy that has anything to do with books, so when I came across this series for review, I had to give it a try! Additionally, my maiden name is Estes, so it's always fun to come across places or things featuring that name, and while I've always wanted to see Estes Park, Colorado, it was fun getting a chance to "visit" this endearing and welcoming town right along with Fred. 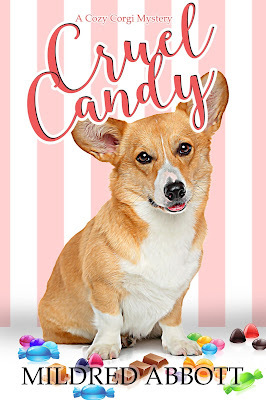 And who wouldn't want an adorable corgi on the cover inviting them to open up the pages! Abbott's casual and friendly writing style really captures this quaint yet quirky community, making you feel right at home right away. The dialogue was witty, humorous, and realistic, which kept the story moving at break neck speed! Readers get to know the neighborhood right along with Fred and follow her on the journey to discover the truth. I enjoyed her style of amateur sleuthing in that she was confident in her abilities when she needed to be, but also knew when to back off and let the authorities play their part as well. As she uncovered clues, her back and forth banter with Watson, her corgi sidekick, added to the charming lightheartedness of the story as it soon became obvious that he thoroughly enjoyed finding treats more than solving mysteries! Overall, this was a delightful gem of a mystery that is an absolute steal on Kindle! This well written plot was short, sweet, satisfying and really set some high expectations for the rest of the series. If you're looking for a place to start in the cozy world, this is an excellent place to start! And if you're like me and you've read quite a few, this one hits all the notes for a highly enjoyable and entertaining cozy that will leave you wondering why you haven't heard of this series before! Rocky Mountain National Park has it all: rugged peaks, pine-scented forests, enchanting bird-watching locations, and… murder. The Cozy Corgi bookshop finally opens, and Winifred Page and her headstrong corgi, Watson, are ready to welcome their first patrons. With her new best friend, Katie, creating heavenly pastries in the bakery on the top floor of the store, Fred’s dreams are all coming together in delicious and unexpected ways. When Katie caters a meeting of the Feathered Friends Brigade and drags Fred along, they expect nothing more than loquacious chatter about birds as they endeavor to build a professional relationship with the owner of the wild bird shop. Fred and Katie are quickly roped into a moonlight snowshoeing hike in hopes of spotting a rare owl. While the endangered bird proves elusive… the murdered man in the snow is hard to miss. Fred’s growing relationship with Sergeant Wexler hits a snag when he forbids her from donning her sleuth hat yet again. But Fred is a lot like her corgi—she doesn’t like being told what to do, even if it puts an end to a possible romance. Opening the Cozy Corgi in Estes Park is a dream come true: small-town charm, fresh-baked bread, hours by the fire reading mysteries, and… murder. For Winifred Page and her devoted corgi, Watson, the puzzle pieces of life are falling into place as they settle into their home in the Colorado mountains. Surrounded by family and friends, Fred begins to relax into the charm and beauty of being the owner of a bookshop and bakery. The buzz of possible romance—though Fred wasn’t looking for a relationship—has quieted as one of her suitors is no longer a viable option while the other has moved into the friend zone. But all thoughts of romance, wanted or not, fly out the window when Fred finds a dead body in the Cozy Corgi bakery… again. Things get stickier when Fred’s main suspect turns out to be a family member of one of the local police officers—the one who already despises Fred and her little dog. Determined not to let past grievances cloud her judgment, Fred tips her detective hat and pokes deeper into the murder investigation. But in a mystery that becomes smoke and mirrors, nothing is as it seems. The revelations Fred unveils threaten not only her picture-perfect world but her very life…. With summer approaching, Estes Park is abuzz with flowers, baking, tourists, and… murder. Tourist season is about to begin, and the lovely weather has Winifred Page and her corgi sidekick, Watson, leaving the comfort of the Cozy Corgi Bookshop and Bakery to reluctantly attend a celebration at the Black Bear Roaster coffee shop. But a chill of uncertainty settles over Fred when a choking death doesn’t seem so accidental—despite the dry, hazardous scones. As Fred and Police Sergeant Branson Wexler rekindle a possible romance, Fred shares her suspicions. But is she seeing murder at every turn? Learning to trust her gut feelings, Fred risks the ire of the coffee shop owner to investigate not one, but two, deaths. As suspects and motives abound, old resentments are uncovered, and Fred and Watson build new friendships even as they follow the crumbs to find clues to a killer. At the height of the summer season, Estes Park explodes with people, wildlife, fireworks, and… murder. The Cozy Corgi Bookshop and Bakery is buzzing with tourists, and Winifred Page and her quirky corgi, Watson, celebrate the Fourth of July picnicking with family and friends—of the human and four-legged variety. As summer blooms with romance for Fred and Sergeant Branson Wexler, murder lurks around the corner. With a friend’s life in danger, Fred and Watson doggedly pursue the investigation, even as Fred finds herself once again at odds with the police department. 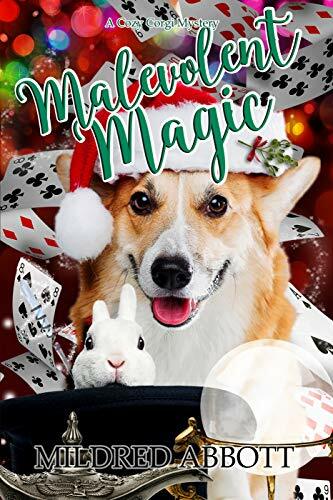 But caring for two chaotic corgis while navigating emotions from the past in the midst of solving a mystery might be too much, and Fred hits a roadblock. As summer draws to a close, the Spirit, Health, and Heart Conference arrives, just in time for Winifred’s sisters to open their store next to the Cozy Corgi Bookshop. To Fred’s surprise, Chakras turns out to be a beautiful addition to the delightful mountain town. The shop even has a room so pleasing in its crystal tranquility that Fred’s corgi, Watson, approves—and hardly anything impresses him. But not everyone is charmed by the crystals, tarot readings, and messages of personal enlightenment. When a famous spiritualist is found dead, Chakras and the entire town is plunged into a conflict that touches the lives of those closest to Fred. Poaching becomes an ever more pervasive problem within the National Park. When Fred discovers a body, of the human variety, while on a hike, she and Watson are pulled into another mystery. Over the days that follow, everything in Fred’s world gets turned on its head and the secrets that are revealed shake her to her core. 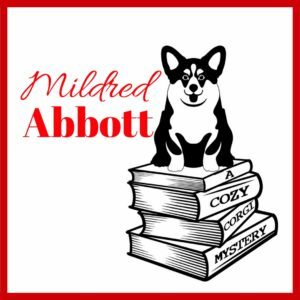 Many thanks to Pump Up Your Book Virtual tours and Mildred Abbott! It was an absolute pleasure reading, reviewing, and hosting! And be sure to check out the other stops on the tour for more opinions and extras!